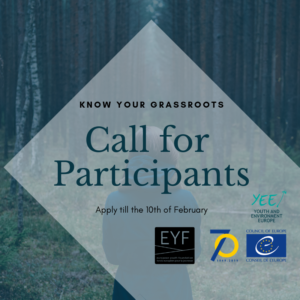 Youth and Environment Europe is announcing an open call for participants for the international seminar “Know Your Grassroots” that will take place from 1 – 7 April 2019 in Dublin, Ireland. Know Your Grassroots is the first activity of YEE’s Annual Work Plan Let Grassroots Grow supported by the European Youth Foundation of Council of Europe. Nowadays in Europe, where many young people still feel skeptical about the institutionalized politics, future of Europe and their participation in the social and political life of their communities, grassroots projects and activism could be seen as the right tool for making a real and youth-led change in society. The aim of the seminar is to define the concept of environmental grassroots projects and their role in fostering youth participation. – To define the concept of environmental grassroots projects and their role in fostering youth participation. – To create a space for peer learning and sharing: exchange of best practices and experiences among youth organisations. – To define the role of environmental youth organisations in supporting environmental grassroots projects. – To equip the participants with overview of environmental grassroots movements. The program will be based on the principles of non-formal education and intercultural learning. We strive for an active, inclusive program that includes direct communication and a sharing of knowledge. The sessions will be balanced between theoretical inputs, workshops, discussions, training and other interactive methods of non-formal learning. We are looking for 28 young people between 18-30, residing in one of the Council of Europe member states, Belarus or Kosovo*. The full cost of working materials, visa and lodging (accommodation in multi-bed rooms, vegetarian food, and refreshments) during the training will be covered by the organisers. Participation Fee: In exchange, we ask for a participation fee of 30 EUR for participants coming from non-EU countries and 50 EUR for participants coming from EU countries, Norway, Switzerland, and Iceland. Applicants for whom paying this fee is an obstacle for participation, should still apply and mention this in their application. YEE will try to find a solution together with the applicant after the selection is finalised. Visa costs will be fully reimbursed. YEE will reimburse 80% of travel cost within reasonable limits and within Europe for all participants. All with the condition to follow YEE travel policy to combine the most economic and environmentally friendly way (lowest price + travel time + CO2 emissions). Please make sure you buy comprehensive travel and medical insurance with your trip in case of issues with your travel or you can’t travel due to last minute emergencies. Please note that YEE cannot cover the cost of medical assistance or rebook any missed flight. Deadline for applications: Sunday 10 February 2019 (23:59 CET).